Mandy Pope’s Whisper Hill Farm teamed up with Three Chimneys in the first session of Keeneland’s November Breeding Stock sale to buy the second foal out of champion female sprinter La Verdad. The partners signed a $800,000 ticket for the flashy grey/roan youngster by Tapit, which was the top price for a weanling in Keeneland’s select opening book. 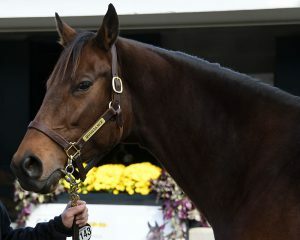 Co-bred by Sheila Rosenblum’s Lady Sheila Stable and Vivien Malloy’s Edition Farm, where she was foaled on March 15, 2018, the filly (Hip 116A) was already an internet star in her own right, having been featured in inaugural season of the National Museum of Racing and Hall of Fame’s Foal Patrol project, which offers real-time streams of in-foal mares during their pregnancy through foaling. 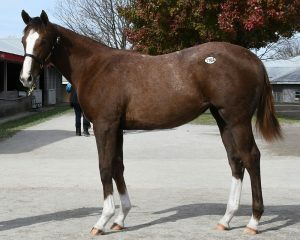 Supplemented to the Keeneland sale on October 18, the foal was consigned by Eaton Sales. La Verdad is not the only star in her immediate family. Her half-sister Hot City Girl by City Zip is a graded stakes winner, Grade 1 performer and $682,050-earner. The sale filly’s third dam Noble Affair is also a stakes winner. La Verdad’s first foal, La Kara Mia by Medaglia d’Oro, was a $775,000 buyback at the 2018 Fasig-Tipton’s Saratoga selected yearling sale. La Verdad is currently in foal to Curlin, while half-sister Hot City Girl (City Zip), also owned by Rosenblum, is in foal to Bernardini and enrolled in this season’s Foal Patrol program. Both reside at Edition Farm. The La Verdad filly was the only New York-bred weanling to change hands on Monday, but trio of New York-bred mares in foal also went for robust price tags ranging from $200,000 to $340,000. Moondance (Hip 143), a winning daughter of Malibu Moon bred by Newtown Anner Stud, sold in foal to new Claiborne sire Mastery for $340,000 to West Bloodstock /Repole Stables. Consigned by Claiborne Farm, the 4-year-old is a half sister to stakes winner Red Hot Buddha and stakes performers Cue the Moon and Knockout Bertie. Her second dam Clever Bertie is a half-sister four stakes winners, led by Traitor and Sun King, and is the dam of stakes winners Allamerican Bertie and Hurricane Bertie. Hip 189, She’s All Ready (Girolamo), who was offered by Vinery Sales, Agent III in foal to Nyquist, went to Spendthrift Farm LLC for $290,000. Bred by Kings and Queen’s Farm and foaled at Rockridge Stud in Hudson, She’s All Ready was a juvenile stakes winner and grade 1-placed runner out of Prominent, a winning Kentucky-bred daughter of El Prado (IRE). Her second dam is stakes winner Biblionic and she issues from the extended family of Canadian Horse of the Year Fatal Bullet. Speed Dating (Not for Love), who was offered as Hip 202 from the Sequel New York consignment in foal to New York sire Union Jackson, went to SF Bloodstock for $200,000. Bred by Mrs. Gerald A. Nielsen, Speed Dating has already produced a pair of winners, including talented 3-year-old Split Time, a three-time stakes winner to date. Speed Dating is a half-sister to Saratoga Snacks, a winner of four stakes races, including the Empire Classic. Second dam Deputy Dear is a half-sister to stakes winners Without Feathers, Currency Arbitrage and Copper Mount. The Keeneland sale resumes Tuesday 10 a.m. with the opening session of Book 2 and runs through November 16.